You probably have security software installed on your desktop, but what about your smartphone and tablet? After all, the security risks to mobile devices are significant, particularly on Android apps available outside the official market. The great thing about security software that works on mobile devices is it can warn you before you visit a phishing site in which a scammer will try to lure you to reveal your personal or financial information. Security software can also protect you from drive-by-downloads, when malware automatically starts downloading to your device when you visit a bad site. And since some apps you might download to your phone or tablet are just fronts for malware that gets installed with an “update,” security software can detect any bad code and delete the app from your device. While there are stand-alone options for mobile devices, Techlicious reported last year that the latest trend in anti-virus software is “all-in-one” security that not only protects your main computer, but your smartphone and tablets as well. They can be slightly more expensive than piecing together your security with different products but you may find the added convenience of one-stop security protection worth it. While it’s a bit later than some competitors getting into the all-in-one game, Symantec recently introduced an invitation-only public pilot program for Norton One, a premium cloud-based security service that unifies multiple consumer computing systems at home. 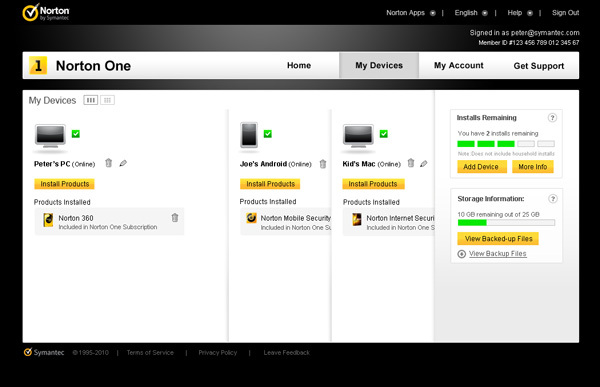 Through its online membership, Norton One protects your entire family’s devices including Windows and Mac computers, and Android smartphones and tablets. Today, Norton One opens up to the general public. One year of Norton One will be $150 and cover up to five devices, with the option to add more later. Norton is also throwing in a generous 25GB of online storage so you can upload important files to the cloud and access them from anywhere you have an Internet connection. And with free tech support for malware issues (see below), the price premium will be worth it for many consumers. UPDATE: We received word from Norton that the launch date has been pushed back to April 4th. If software you can download to your desktop is more up your alley, Norton announced it soon will be launching its Norton 360 Everywhere multiplatform security solution for Windows-based PCs and Android devices, although it hasn’t said how much it will cost. Basically, it provides the same features as Norton One—minus the 25GB of cloud storage for your files—but lets you manage the software from your desktop instead of on the cloud. Once you install Norton 360 Everywhere onto your desktop, it updates your security files continuously—as much as several times an hour. Mobile devices with a Norton app installed auto-sync once a week (or daily, if you so choose) with the Norton platform to get security updates. Norton One and Norton 360 Everywhere give users access to security advisors within two minutes, 24 hours a day, every day of the year who are trained to resolve malware issues.